Background: Today, patient safety is an important issue in providing hospital services. Any failure in this area can cause undesirable consequences. Objective: The present study evaluated the status of patient safety culture in Educational Hospitals of Tehran, Iran. Methods: This cross-sectional study surveyed 205 therapeutic and diagnostic personnel of three Tehran hospitals selected using the clustered method; samples were collected in a randomized manner. To examine patient safety culture, the standard questionnaire of patient safety culture with 12 dimensions was used. Data was analyzed using SPSS software. Results: In the 12 dimensions of patient safety culture, exchange of data, expectations, and organization management had the lowest means of 3.28 (±0.87), and 3.32 (±0.74) among the various aspects of patient safety culture. Additionally, the two dimensions of teamwork within the organization’s units and frequency of reporting events with means of 3.71 (±0.79) and 3.73 (±0.7) had the highest means among the studied 12 dimensions of patient safety culture. The total mean of patient safety culture in the studied hospitals was 3.5 (±0.5). Conclusion: Increasing the attention paid to patient safety culture will lead to the development and progress of hospitals in the country and will guide them toward becoming patient-friendly hospitals. Those dimensions which had low mean values in this study should be paid more attention so as to promote and protect them. James JT. A new, evidence-based estimate of patient harms associated with hospital care. J Patient Saf. 2013;9(3):122-128. doi:10.1097/PTS.0b013e3182948a69. Weller J, Boyd M, Cumin D. Teams, tribes and patient safety: overcoming barriers to effective teamwork in healthcare. Postgrad Med J. 2014;90(1061):149-154. doi:10.1136/postgradmedj-2012-131168. Makary MA, Daniel M. Medical error—the third leading cause of death in the US. BMJ. 2016;353:i2139. doi:10.1136/bmj.i2139. Singh H, Sittig DF. Advancing the science of measurement of diagnostic errors in healthcare: the Safer Dx framework. BMJ Qual Saf. 2015;24(2):103-10. doi:10.1136/bmjqs-2014-003675. Thomson S, Osborn R, Squires D, Jun M. International profiles of health care systems 2012: Australia, Canada, Denmark, England, France, Germany, Iceland, Italy, Japan, the Netherlands, New Zealand, Norway, Sweden, Switzerland, and the United States. http://www.commonwealthfund.org/~/media/Files/Publications/Fund%20Report/2012/Nov/1645_Squires_intl_profiles_hlt_care_systems_2012.pdf. Published 2012. Schutz AL, Counte MA, Meurer S. Development of a patient safety culture measurement tool for ambulatory health care settings: analysis of content validity. Health Care Manag Sci. 2007;10(2):139-149. Morello RT, Lowthian JA, Barker AL, McGinnes R, Dunt D, Brand C. Strategies for improving patient safety culture in hospitals: a systematic review. BMJ Qual Saf. 2013;22(1):11-18. doi:10.1136/bmjqs-2011-000582. Trzeciak S, Rivers E. Emergency department overcrowding in the United States: an emerging threat to patient safety and public health. Emerg Med J. 2003;20(5):402-405. DiCuccio MH. The relationship between patient safety culture and patient outcomes: a systematic review. J Patient Saf. 2015;11(3):135-142. doi:10.1097/PTS.0000000000000058. Aiken LH, Sermeus W, Van den Heede K, et al. Patient safety, satisfaction, and quality of hospital care: cross sectional surveys of nurses and patients in 12 countries in Europe and the United States. BMJ. 2012;344:e1717. doi:10.1136/bmj.e1717. Nieva V, Sorra J. Safety culture assessment: a tool for improving patient safety in healthcare organizations. Qual Saf Health Care. 2003;12(suppl 2):ii17-ii23. Sorra J, Nieva VF. Hospital survey on patient safety culture. Agency for Healthcare Research and Quality; 2004. Azami-Aghdash S, Azar FE, Rezapour A, Azami A, Rasi V, Klvany K. Patient safety culture in hospitals of Iran: a systematic review and meta-analysis. Med J Islam Repub Iran. 2015;29:251. Salarvand S, Moayyed Kazemi A, Bahri N, et al. Assessing medical staff’s view of patient safety culture. Iranian Journal of Nursing Vision. 2015;4(3):54-64. Nourmoradi H, Kazemi M, Pirmoradi F, et al. 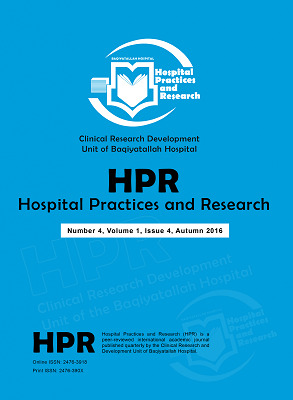 Hospital Patient Safety Culture in Developing Countries: A Comparative Study in Ilam City, Iran. Br J Med Med Res. 2015;10(5):1-8. Moghri J, Akbari Sari A, Rahimi Forooshani A, Arab M. Patient safety culture status in general hospitals affiliated to Tehran University of Medical Sciences (Persian). Hakim Research Journal. 2013;16(3):243-250. Nasiripour AA, Jafari S. The relationship of quality improvement and patient safety with performance indicators in Shahid Beheshti University of Medical Science teaching hospitals (Persian). Journal of Payavard Salamat. 2016;10(4):311-319. Hellings J, Schrooten W, Klazinga N, Vleugels A. Challenging patient safety culture: survey results. Int J Health Care Qual Assur. 2007;20(7):620-32. doi:10.1108/09526860710822752. Alahmadi H. Assessment of patient safety culture in Saudi Arabian hospitals. Qual Saf Health Care. 2010;19(5):1-5. doi:10.1136/qshc.2009.033258. Salavati S, Fanoosi T, Dehghan D, Tabesh H. Nurses’ perspectives on patient safety culture. Iran J Nurs. 2013;26(84):24-33. Leape LL, Brennan TA, Laird N, et al. The nature of adverse events in hospitalized patients. Results of the Harvard Medical Practice Study II. N Engl J Med. 1991;324(6):377-384. Bodur S, Filiz E. A survey on patients safety culture in primary healthcare services in Turkey. Int J Qual Health Care. 2009;21(5):348-355. doi:10.1093/intqhc/mzp035.